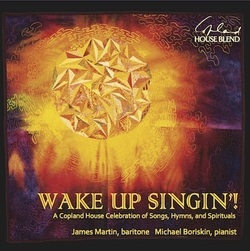 HEAR CLIPS FROM THIS EXCITING NEW CD AND OTHERS! Baritone James C. Martin has won critical acclaim for his performances in opera, musical theater, and concert as a versatile singer, actor, and entertainer. Always an audience favorite, his artistic repertoire spans from Bach to be-bop, Busoni to Burleigh, and Berg to Bernstein. He has appeared with leading musical organizations throughout the United States and abroad, including the opera companies of Mississippi, Chicago, San Francisco, Santa Fe, St. Louis, New York, Toronto, Strasbourg, Basel, and Oslo; the music festivals of Marlboro, Ravinia, Aspen, Moab, Colmar, and Tel Aviv; and concert appearances at the Concertgebouw, the Library of Congress, Washington National Cathedral, Avery Fisher Hall, Alice Tully Hall. In addition to a successful performance career Mr. Martin is an accomplished teacher, coach, director, producer, facilitator, and arts education advocate. As a Teaching Artist he has toured classrooms and educational performance venues for The Metropolitan Opera Guild, New York City Opera, New York Festival of Song, Lyric Opera of Chicago’s Opera in the Neighborhoods, and Mississippi Opera. James has served on voice faculty as Teaching Artist in Residence at Jackson State University and Millsaps College where he was director/founder of the Lyric Performance Practicum and chair/founder of the Millsaps Music Symposiums.